be held during April 20th - 22th 2015 at Okinawa Jichikaikan, Naha Okinawa, Japan. 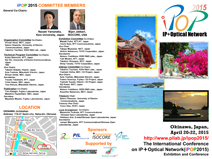 iPOP2015 will be held with Okinawa Open Laboratory. for ipop2015 participants of Okinawa Open Laboratory, who are co-hosting ipop2015. We have successfully closed iPOP 2015 11th International Conference/Exhibition on IP + Optical Network. iPOP2015 gathered almost 350 participants from US, Europe, China, Korea and Japan. Note that, this is the first iPOP held in outside Tokyo area, Naha Okinawa. This iPOP is sponsored by PIL, ISOCORE USA and Okinawa Open Laboratory (OOL). During iPOP, we had a chance to visit OOL that is a fruitful experience to see real SDN control network and NFV equipment. Thank you very much again for all committee members, volunteers, contributes and attendees. I would like to see you at Washington DC or next iPOP at Keio University 2016. Thank you very much. May. 20, 2015 Showcase Whitepaper is uploaded. May. 15, 2015 Thank you message in this page is uploaded. Apr. 10, 2015 Program at a Glance is updated. Mar. 31, 2015 Online Proceedings page is uploaded. Mar. 27, 2015 Program at a Glance is updated. Mar. 26, 2015 OOL Tour (in English) and OOL Tour (in Japanese) pages are uploaded. Mar. 25, 2015 Registration is started. Mar.20, 2015 Call for Participation is uploaded. Mar. 19, 2015 Welcome Remarks page is uploaded. Program at a Glance is uploaded. Mar. 18, 2015 Participants page is uploaded. Mar. 9, 2015 Call For Exhibition is updated. Mar. 5, 2015 Keynote page is uploaded. Feb. 17, 2015 Committee page is updated. Feb. 16, 2015 Call For Exhibition page is uploaded. Feb. 2, 2015 Committee page is updated. Jan. 26, 2015 Call for Presentation is updated. Jan. 15, 2015 Submission deadline of one-page abstract is extended. Dec. 17, 2014 iPOP2015 web site is open !